4 Year Old - Right or Left-Handed? My son just turned 4 years old last month. I feel he has trouble with some fine motor skills (writing, coloring, grasping, playing with play-doh, etc.) I am looking forward to trying many of the activities I have read about on this website to try and develop those skills. I really want him to be as prepped as possible for Kindergarten. One question I have is how to know if your child is left or right-handed. When should it be clear? He often seems to favor using his left-hand, but sometimes does switch off. I realize some tools work better for left-handers especially as far as cutting goes, but if I am not sure if he is right or left handed, how would I tell which side to work with??? Thank you for this wonderful website....very helpful!!! Comments for 4 Year Old - Right or Left-Handed? Hand dominance (or hand preference) in children usually develops between the ages of 18 months and 4 years, and most children entering Kindergarten at age 5 have a well established dominant hand. However, there are still many children whose hand preference is only confirmed in Grade 1! A mom's instinct about whether her child is left or right handed is usually the correct one. However, it would be good for you to try and figure out why he sometimes swaps, and take steps to help him. Does he start with one hand (and if so, which one does he usually start with) and then swap once he gets tired? If so, then by helping him to develop his fine motor skills, he will gradually build up endurance in his preferred hand, and he will thus not feel the need to swap as often. Or does he use his left hand when things are presented on his left side and his right hand when things are presented on his right side? If so, he may have some midline crossing delays. Try some midline crossing activities (I will build a page and put the link in this thread SOON!) and in the meantime put his crayons, fork, whatever in his midline (ie at his bellybutton) to see which hand he reaches with. If he consistently reaches with his left hand for objects, then he is more likely to be left handed. Doing lots of bilateral coordination activities will also help his hand dominance to emerge more strongly. I hope this helps for now? Let me know what you find with regard to the reason why he is swapping hands, and I will post the links to the info pages in this thread as they are built. PS if you are convinced he is left-handed, check out the resources available at http://www.lefthandnz.com/forchildren.html . They have some great stuff! Hi there, the pages are live now! There are a few pages of information and activities linked to the "hand dominance" and "midline crossing" tabs on my nav bar (on the left). I hope these help. Let me know if you have any further queries! My 4 year old daughter seems left handed, means whatever she does, she does with left hand, but when it comes to writing, we noticed she uses right hand, is this normal? She is normal 4 year old, i mean whatever should be her learning by this age, she is doing, so seems normal. But my husband, thinks that if she is left handed she should write with left hand, and will help a lot more in her development. And my opinion is, if it comes to writing she always always go with right hand, she is not trying its going naturally, so why let her confuse and should we force her....Please advise. I would advise you to watch your daughter very carefully to get some more clues. 1) Is she using her right hand because she sees others use the right hand for writing? Did her teacher maybe put the pencil in her right hand? 2) does she swap hands when she is tired of writing? 3) Does she ever switch hands for other tasks where she starts with her left hand? She is still young, so make sure she is crossing her midline properly with both hands, so she is not using one hand on one side and the other hand on the other side. Read my article on switching hands or try the suggestions made by C Hackney in this article to get a better idea of which hand is your child's dominant hand. Come back and let me know if you have any further queries, or if things clear up for you. Most Occupational Therapists would also carry out a screening or evaluation to help you if you are still unsure in a few months time. I'm an entry level OTA at a ped's clinic and I am having some instances recently where mom's are telling me they want their child to be right handed not sure if it's because of a culture thing. I am left handed myself so sometimes I'm not sure if the child chooses to use their left hand because that's what I sometimes model. I try to remember to present items in the middle so I can get an idea of what hand they tend to favor and I will try to model that side for them when practicing writing or FM activities. One is age 4 and the other is 8. The 8 yr old I have accepted because that's what they are doing at home and at school but I feel that he does better with his left. The 4 year old I don't feel comfortable making him use a certain side since it can take until 1st grade to establish hand preference. I feel he switches hands because he becomes fatigued. He crosses the mid line just fine but mom stated she doesn't want him to be left handed. Have you ever dealt with a situation like this? If so how did you handle it? If not how would you tell their parents it's ok for them to be left handed. I just don't want the parents to feel that I am disrespecting their choice. One of the first kids I ever worked with was a little boy who came out strongly left in our tests, but his father (an autocratic type) absolutely insisted he did not want his son to be a weakling, and insisted we train his right hand. It broke my heart :-(! I also had a child who we suspect would have been a lefthander, but suffered a birth injury, which let him with a weakened left hand, and the parents decided to rather train him to be right handed for writing. In both cases, training the right hand was HARD WORK because the left side of the brain was just not ready and wired to do that task. Writing was always stressful and tiring, because it demanded more conscious brain power from them. 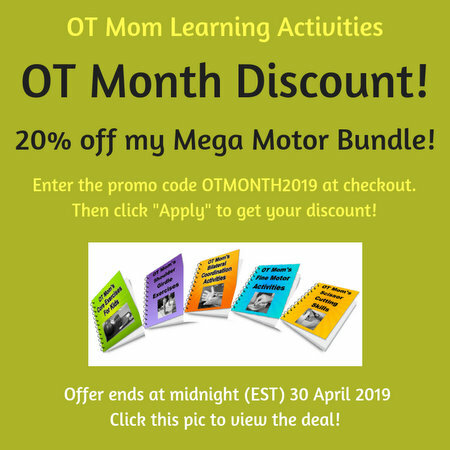 Since then, there have been kids who have been "undecided" and I have encouraged parents to have an OT assessment and to observe them very carefully before making the decision to go left or right. Since starting this website, I have had a mom tell me she and her husband made their son be a righthander even though she suspected he was left, and that at the age of 9 she realizes she made a mistake and wants to change him back! It is hard. In some cultures, left handedness carries a stigma, and it is very important to help parents understand that their child can no more change his true handedness than he can change his eye colour. A child's true handedness is determined by which brain hemispheric is most dominant, which is not something we can change. Handedness is not something parents should be choosing for their child, it is a part of the child's make-up. Some children just need more encouragement, guidance and facilitation to help their dominant hand emerge. Forcing a child to use the right hand if they are naturally left handed, will force the left brain (which directs the right hand) to do a task for which it was not designed. This requires far more effort, energy and often produces an inferior result. In addition, the right hemisphere, which was primed to direct the left hand, can no longer do so, and can also not take over any right brain strengths. This could lead to frustrated creativity, and other problems stemming from frustration. All in all, I strongly feel that a left handed child will be more functional, happier and will be able to achieve his full potential if he is allowed to be left handed. To swap the 8 year old back would be traumatic for him and for his family - they would all have to be 100% behind the decision, which is unlikely, as it is a lot of hard work switching back. But the 4 year old should be encouraged to strengthen the hand muscles in both hands (try these hand exercises with both hands and see which hand emerges as more dominant. And carry on with making sure he crosses the midline properly. And speak to the mother to try and get her to identify her fears, to see why she thinks it will be a stigma. I hope this helps! You have done the right thing to be concerned about these children and to find out more. Feel free to contact me through my site if you have any further questions. Hi there, I wish I'd come across this two years ago. I have twin boys, one of which was entirely left-handed until he turned 4. He spent most of his fourth year switching back and forth between his right and left hand when writing. I thought it best for him to sort it out on his own so let him be. By the end of preschool he settled into right-handedness for writing. However, he is now 6 and he still does all his sports left-handed. I noticed when he was learning to throw a Frisbee last weekend he tried both ways, and kept trying to throw with his right hand but was much much better with his left hand. At this point I stepped in and told him to stick with his left, which he happily did. In addition, his right-handed writing is incredibly messy, he has not improved with time nearly as fast as his twin brother. My question is, at 6 3/4 (entering grade 2) is there any point in seeing if he can switch back to left-handed writing? If not, is there anything I can do to help him with his right-hand writing? My child is almost 4 years, and he is currently switching his hands in many tasks. and I really cant figure out which hand does he prefer. Earlier he was consistently using his left hand, especially in Sports ( tennis) and his left leg in football. But surprisingly now he is switching his hands and myself and his class teacher have noticed that he is late in fine motor skills, though he is very good in other stuff. how can I help him? and how can I know whether he is left or right. I am a bit concerned. There are a lot of comments on this page asking for advice in knowing whether your child is left or right handed. Or whether to swap your child back to what he/she was before! I really recommend that you find a pediatric occupational therapist near you who can do an evaluation of handedness as well as ascertain the underlying reasons for any switching of hands. The therapist would also be able to say whether switching back to a previously preferred hand is a good move or not, depending on your child's inherent abilities with either hand. And should give you activities and advice to help your child with the decision. I know this may be an expensive option at first glance, but I cannot recommend it strongly enough. So many parents have regrets further down the line when they see how much their child struggles in school owing to incorrectly resolved handedness issues. Please take the steps to find an occupational therapist! There are a lot of things that parents can do with their kids at home (the whole reason for this website! ), but ascertaining handedness in a tricky situation really needs an expert opinion. All the best as you help your child! Right or Left or Ambidextrous? Hi I have a 5 1/2 yr old in K. He uses both hands for writing and tasks. Do I need to help him decide which hand is dominant? Why? or do I let him figure it out? Why? Could he be Ambidextrous? Is My Child Left Handed? My child has mild CP. It affects her lower limbs mainly.She has hyper flexibility of her fingers. She has poor concentration,difficulty copying shapes ,etc. She writes with her right hand ,but becomes extremely frustrated and tires easily.She often refuses to write or has a meltdown over it. She likes to colour ,but becomes frustrated with herself because she can't colour for as long as she would like to. She picks up objects probably 98% of the time ,wherever they are with her left hand. She always seemed to favour her left hand ,but her physio said that she couldn't be left handed because this was the side that her CP affected.How can I tell whether she is left handed and whether her frustration ,etc could be partly down to the fact that she has to use her right. I like what im reading here the best way in my preference is sit something down you in your everyday life with pick the object up with your dominant hand as so your kids. I am left handed and there is nothing wrong with it less than 15% in the whole world will be left handed its something to take pride in. You can't change the handedness of a kid if they are left handed all they will become i possibly ambidextrous but they will still have to use there left hand more in life because there eyes have a dominant one as well which is the result of needing a left or right handed bow, baseball glove, golf club, gun, and so on so if you force right handed on a potential left handed person you can ruin there future fun in life. Hi, I am from the UK and my 5 year old son is in Primary 1 class which would be the same as your Grade 1. As far as I have been concerned he has always been left handed but we are having a real problem getting him to work out which hand he wants to use. His teacher and I had agreed that we would encourage him to use his left hand as we both agreed this is his dominant hand and things had improved but yesterday she found he was using his right hand and when she told him to use his left he couldn't even work out how to hold the pencil. He kicks a ball with his left foot, he uses his knife and fork as though he is left handed, he almost always starts writing with his left hand which is why I believe he is left handed. I don't believe he swaps because his left hand gets tired, it's almost as though his brain is telling him it's more comfortable to use his right hand. When I ask him which hand he wants to use he tells me his right hand but I'm not sure if this is because everyone around him is right handed so he doesn't want to be different. In pre-school last year his teacher told me he will colour in the left hand side of the page with his left hand the use his right hand for the right hand side of the page. He will still do this when he is using his white board for his spellings but it's because when he uses his left hand he ends up rubbing out his work when he writes. His writing with both hands is equally as good so I can't say one is worse than the other. His teacher and I are unsure of what to do now, are you able to give me any advise on how to help him? My friend who is a teacher has suggested using moulded pencil grips which force him to use one hand. Do you think this would be helpful? I would really advise you to try and get an Occupational Therapy assessment, as a pedicatric therapist can do a whole range of tests to see which hand is more functional in a whole range of different tasks. An OT can also check out midline crossing and see if there are any delays which would be causing him to swap. If he is truly more comfortable using his right hand, and the OT confirms he can specialise with his right hand, then try and help him develop his right hand as much as possible with lots of scissor cutting, hand and finger exercises (lots of fun, easy ones on my site) so it can become better at pencil control. I am sorry I can't give more specific advice online without seeing your child. Hope this helps a bit, and that you are able to get an OT appointment without too much delay. My son claims and chooses to write and color with his left hand. He does not have as much control as some of the kids in his class. I noticed when using his leapfrog writing pad he tracing over the letters pretty well with his right hand. I am not sure if he would do it with well on paper because he refuses to try writing with his right hand on paper. When using scissors and playing baseball he switches back and forth which he throws with and cuts with. Sometimes he starts cutting with the left because we place them there since we thought he was a lefty but when we don't start him with the left it is inconsistent of which hand he uses first and he switches back and forth. Both hands are not very good at cutting. He throws pretty well with both but I'd like to figure out which mitt to start training him with since they will be using them soon. There is no consistency on which hand he throws with first. How can I determine which one he is and successfully direct him to use that hand? I want to help him get better with his fine motor skills so he doesn't continue to fall behind. I really would recommend that you seek an occupational therapy evaluation. This would get to the heart of any issues that are contributing to the constant swapping of hands. Once the underlying strengths and weaknesses have been identified, then I am sure the therapist will be happy to give you ideas and resources to help you work on the chosen hand.